This powerful app from CAD Design Software will move selected entities to a user specified grid in a snap! (pun intended)! 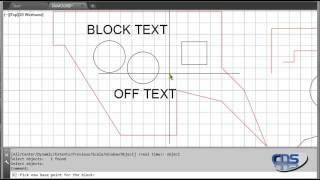 Not only can this be used on lines, splines, leader traces and text but also blocks and sub-blocks. With the click on a checkbox, entities inside blocks can also be individually snapped to a grid! Download your free trial today! Also see our GRIDFINDFIX and GRIDCHECK apps.